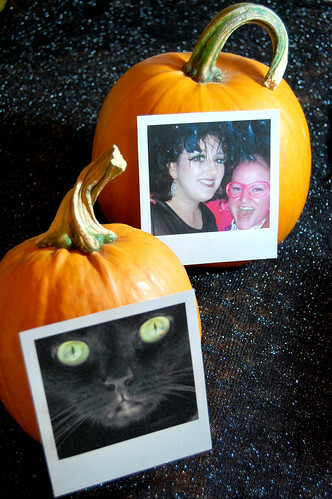 Here’s a fun photo craft project that you’ll want to make several different versions of! 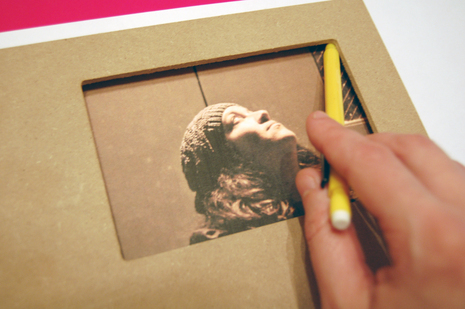 It’s a cool way to show off your photography skills and also take a photo frame beyond just another plain jane frame. For the frame above, I used an image of my friend Silvia that I took outside an elementary school. I liked the atmosphere, texture (those marks you see are actually on the door in the photo), and artsiness of it. 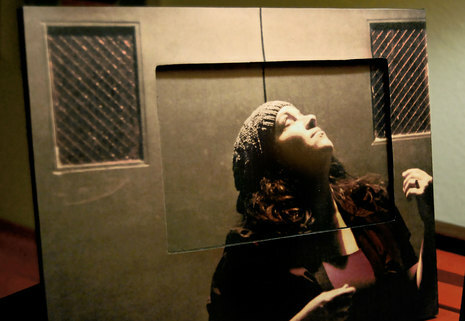 Having her face in the cutout area gave the photo more depth and interest. Before you begin this project, there are a couple of things to note. This project works best using a wide edged frame, atleast a couple inches of frame around the photo. Also, you will need to take special consideration in the photo you use. I started this project using a closeup of my niece with her hair blowing in the wind. While it was an interesting photo, the frame opening cut into her forehead and it looked like I was doing mad scientist stuff to her head. OK, here’s how you make it! 1. Measure and notate the overall dimensions of your photo frame and the distance of the photo opening from the top and bottom of your frame. The frame I used below was from Michaels. 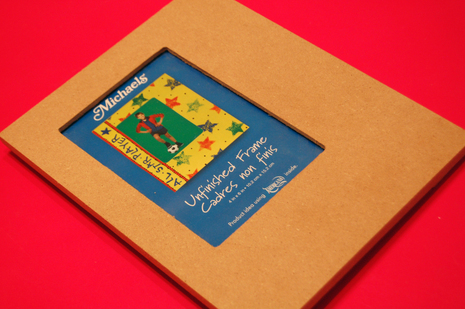 On a side note, I actually designed the Michaels insert you see below on this frame. It’s one of the many types of projects I do in my “day job”. 2. 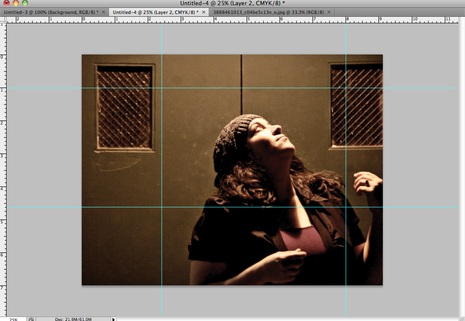 Make a document the overall size of your frame in your photo editing program. Open your photo and place into this document Using guides mark of the areas of the photo opening as seen below. You may need to move/enlarge/adjust your photo to fit the opening. 3. Print out two copies onto matte photo paper. 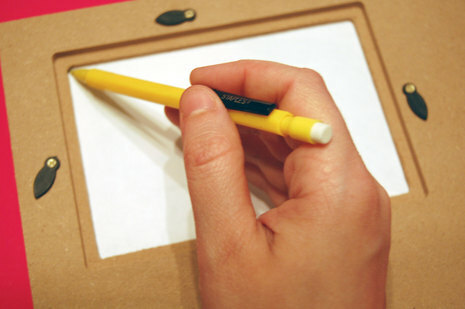 Then lay the frame on the top of the photo and mark the open areas with a pencil. Removd the frame and using an Xacto, cut out the picture for the inside of frame. 3. Cut around the other photo. Lay the photo frame face down on the back of this photo. Align the frame to fit the image exactly and trace around the opening of the frame from the back. Carefully cut out this box on the photo. 3. Using black spray paint and following can directions, spray paint the front, sides, insert, and back of the photo frame. Let dry. 4. Flip the photo with the cutout opening over and spray the back of the photo with the Tacky Spray. Immediately line up and press onto front of frame, making sure to smooth out any wrinkles or air bubbles as you go. Spray frame with an Matte spray sealer specially formulated for photo paper to preserve photo on the outside of frame. 5. Insert photo inside frame and you’re finished! 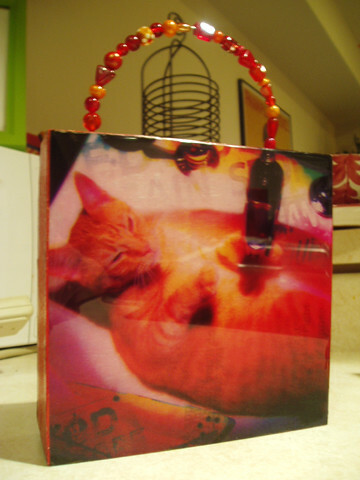 Make your own Photo Box Purse! 1. Open your image in Adobe Photoshop or other image editing software. Crop your image to be 6.25″ x 6.25″ and print your image onto cardstock according to printer specifications. 2. 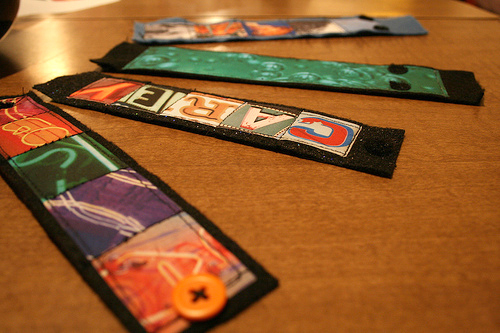 Using scissors or paper cutter, cut out image and set aside. 3. Mix one part red acrylic paint with one part Staining/Antiquing medium. Using paint mixture, paint entire box with foam brush, being careful not to get paint on handle (only unless you want you handle painted the same color too). Paint the handle black and let dry. Paint inside of purse if desired and also let dry. 4. Spray back of photo lightly according to directions with Tacky Spray (in a well-ventilated area). 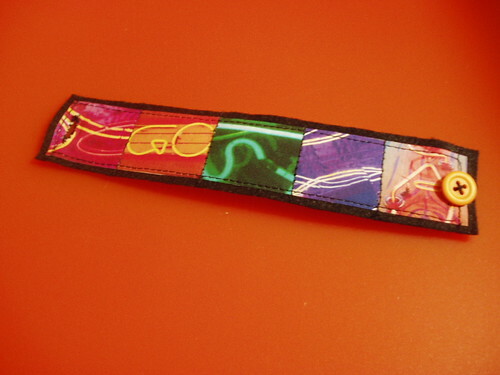 Adhere image to front of purse, pressing firmly to release any air bubbles. Use stamp pad to go around adhered image to get ride of white edge. Let dry. 5. Use fine-grit sandpaper to sand the wooden purse (except for the lid) and handle in the direction of the grain to create a distressed appearance. Wipe with a damp paper towel to remove dust. 6. Ink all edges of the purse (including the lid) with the black ink pad to age. You can even distress areas of the photo with the ink pad if you are brave. Let dry thoroughly. 7. Seal off all sides around photo edge with masking tape. This will help prevent resin runoff on the sides of your purse. 8. Now here comes the fun resin part! Go outdoors or in a well ventilated area and Mix up the two part Envirotex resin. 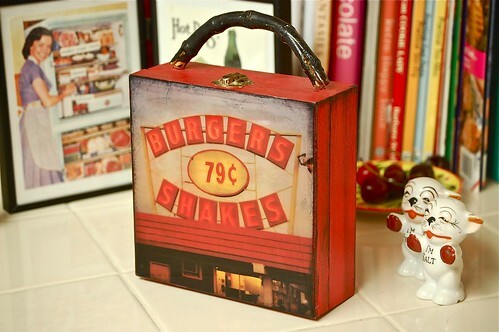 Place the box flat with the photo side up on a piece of wax paper. Pour in small amounts a little at a time and use a chopstick to spread out to the edges to get even coverage. Believe me, a little resin goes a long way. It flattens out and can run down the edges if you use too much, so use sparingly! Blow out any air bubbles with a straw (Thanks Crafty Chica for the straw and chopstick tip!). Let cure over night. It will take a couple days to fully dry, so let it cure and dry in an area free from dust and debris. 9. Once resin is dry, remove masking tape from around box and touch up any needed areas. 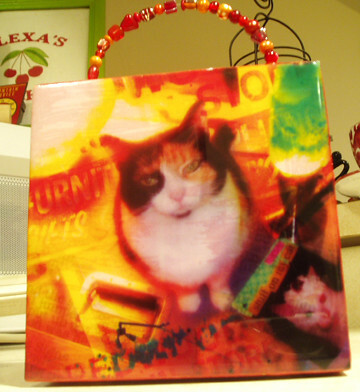 Here’s another one of these purses I made for my friend using Photoshopped images of her cats on each side. I also made her a custom beaded handle. She loved it! 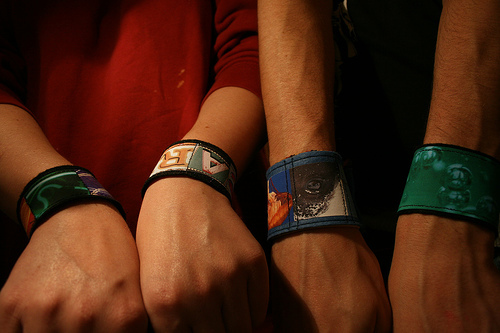 Enjoy and show off your new purse!